Passenger vehicle overturns on Arava Road; 35 year-old woman killed, 3 others suffer moderate to severe injuries. A 35 year-old woman was killed and three passengers were injured in a car crash Saturday night, along the Arava road (90). The injured passengers suffered moderate to severe injuries and were taken by paramedics to Soroka Medical Center in Beer Sheva. A Magen David Adom (MDA) spokesperson reported, "At 2:18 am we received a call from the Southern office reporting an overturned passenger vehicle on Road 90, about 3 km south of Be'er Menuha. 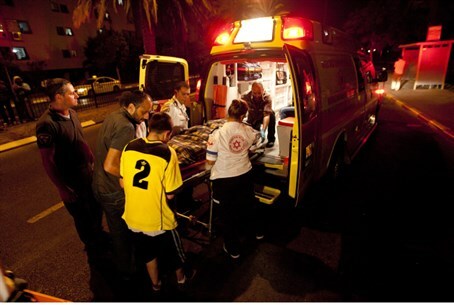 MDA paramedics instantly rushed to the scene with ambulances and medical equipment, as well as a Mobile Intensive Care Unit and two IAF helicopters." They treated 4 injured, one of whom died from her injuries; of the remaining 3 passengers, one suffers severe injuries and the others have been listed in moderate condition. All three were transported to Soroka medical center. MDA spokesman Zaki Heller added, "The passengers were trapped underneath an overturned vehicle. They received treatment under the vehicle before extraction, then were extricated and transported to Soroka Medical Center via helicopter." MDA medic Alon Herlinger was at the scene. "When we got there we saw a car had been flattened by the side of the road - probably after turning over several times," Herlinger recounts. "There was a man and a woman trapped inside the vehicle, and another couple outside the vehicle." He continued, "We immediately began treatment. Three of them were unconscious and one had no vital signs; in a short time we had to declare her dead at the scene." About the injuries themselves, "One had a severe head injury; one suffers multi-system injuries; and one man had chest injuries which we've determined to be moderate to severe," Herlinger stated. "After treating them at the scene, we transported them by helicopter to Soroka Medical Center." "We think that the car held four people traveling from Jerusalem to Eilat, and that they appear not to have been relatives," Herlinger concluded.